With prices starting from just £20, treat yourself to a CND Shellac or Gel II mini manicure or pedicure. Includes nail re-shape, intensive cuticle tidy, gel polish application, cuticle oil application and a mini hand / foot massage. Do you want a super - shiny, long lasting, non-fading, on -trend nail colour? Reaction polishes that change with temperature? Want something a little brighter - say psychedelic neon colours? You can have it. Choose from an amazing selection of iridescent, holographic, multi-glitz and ultra fine glitters of every colour you can think of, foils, Swarovski crystals, additives or stamping nail art - the possibilities are endless! Have a look through the our gallery for examples of some nail gorgeousness. Get your hands and feet summer ready with a Pure Oraganics manicure or pedicure system - the ultimate hand and foot luxury treatment. A Pure Organics Diamond Pedicure is a 6-Step organic product based manicure / pedicure system that is formulated to rejuvinate and revitalise skin. When submerged in water, the kit's bath crystals transform into soft, dazzling beads that shine like diamonds. Included in the Diamond Treatment Pedicure are Diamond Spa Crystals, Ocean Spa Crystals, Sugar Spa Scrub, Purifying Mask, Continuous Massage Lotion for a luxuorious hand / foot massage and Spa Cuticle Oil. 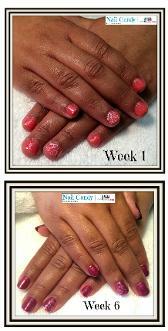 Finish the treatment with the application of either normal or gel polish. No other salons in Milton Keynes offer this luxury treatment so make an appointment today. Initial Applications start from just £8 (thereafter, £5). Nail Biter? Don't worry - I have a special "Healthy Nails" Programme desgined to help you break the habit in just 6 weeks and help you grow and maintain long, healthy, beautiful nails. Weekly consultations will ensure that your Gel polish is always perfect with no chipping or lifting that may otherwise encourage you to start biting again. 100% success rate - what you got to lose? Need a little TLC for your hands and feet? I guarantee there will be a fabulous treatment to suit your needs! We only use trusted brands for the application of CND Shellac or Gel II manicures and pedicures. What a little more? Pamper your hands and feet with a Pure Organics deluxe manicure or pedicure - exclusively at Nail Candy Milton Keynes.